Having your yard stand out is something that many homeowners want but do not actually move forward with. If that’s you, it can be an excellent idea to speak with us here at Architectural Landscape Design. Not only are we able to make your home stand out among the others in your neighborhood, but we have an eye for all things beautiful outdoors. Here are some of the things that we can provide you with so you’re able to use the natural beauty in your yard to make it come together as a whole. First, we will take a look at what exactly is in the yard currently that we can use. We will assess the buildings, trees, flowers, foliage, the outdoor furniture you already have, and so on. We want to come up with a design that suits you and your home but also is going to make a statement for anyone else that is looking at it. Do you have an idea of what it is that you’d like? We get our landscape design inspirations from the visions and dreams of our clients. Creating a space specifically for you means your input. We will then be able to make a design built with your specifications in mind. We are able to then use all of the aspects of your yard and turn them into something that is beautiful or useful. We can add a waterfall on a slope or perhaps a retaining wall on a split level yard. These are all relatively easy to do since you have the property layout for them. We can work with your yard’s natural terrain and enhance the existing features by making some deliberate alterations. Changing the walkway in the yard is an ideal way to change the look of the home and overall landscape.This could mean re-routing existing pathways and/or changing the walkway material. 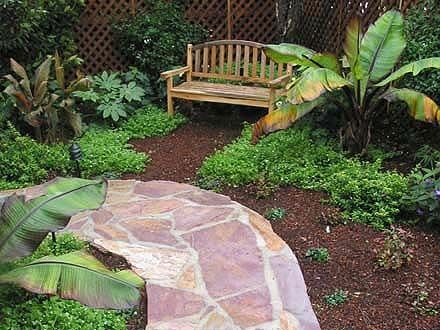 And walkways can be extended into other areas to invite your visitors into other spots in your yard that you’d like to play up. We can use the shading in your yard to our advantage. Placing your outdoor furniture in a shady area will create a nice, cool spot to stretch out and relax. This can be a terrific way to transform an area where grass won’t grow, like under trees. By mulching the spot and converting it into an outdoor room, you hide the imperfection so the rest of the yard stands out more. We’ll help you consider the materials that you’d like to use in your landscape – we have many to choose from to suit your needs as well as the style of your home and your yard’s existing features. By adding natural elements such as boulders, rock gardens, wood bridges or arbors, we can take your yard from ordinary to fantastic. This can be done in the back or front yard of your home to make it stand out from the rest of the homes on the block. If your home blends into the neighborhood and gets overlooked, perhaps it’s time to speak with us more regarding the landscaping needs that you have. We are happy to help you convert your dreams to reality. Give us a call; we are your licensed MN landscape contractor, and we serve the entire Minneapolis St. Paul metro area, as well as outlying communities in Minnesota. For some inspiration, check out our Pinterest boards to find out more about some of the landscaping projects we’ve worked on in the past as well as some landscaping ideas that may work for you. For a free initial consultation, call us at 952.292.7717.